Good ergonomic posture at your desk is important. Even more important – take frequent breaks to walk and stretch. 1) Break up the repetitive nature of your motions. Get up and do a lap around the office (or house) every hour or so. Change your routine: Instead of typing on Tuesdays and filing on Wednesdays, do a little of each both days, so you aren’t making the same precise movements for hours. Can you switch to the other side or hand? Even small changes can make a difference. For example, my knitting friends who have trouble will opt for a different size needle (which affects hand position and motion) or even type of project. The more variety the better. 2) Double check your ergonomic situation. It may be helpful to get someone to take a picture of you while you’re working so you can see your own posture. If you use the phone, try a headset. Sitting at your computer, you should be looking straight ahead at the top third of the screen. If you are looking up or down, adjust either your seat height or the monitor. Your elbows should be resting at 90 degrees, and your wrists should be straight. Having them bent down or cocked back for the keyboard increases strain. Your knees should be at hip height or just above. If your chair is too tall, use a footrest. If you have a penny-pinching boss, you should know that OSHA can send out an ergonomic expert (free!) to suggest cheap/free fixes in your office. When playing sports or working out, consult a coach or professional trainer to be sure you’re using good form. Learn the anatomy relating to your activity. In addition to preventing injury, your performance will improve! I used to be a bodybuilder and certified trainer, so feel free to ask me if you have any questions. 3) Stop as soon as symptoms start. Give your body a chance to heal. Ice and anti-inflammatory drugs like ibuprofen may be helpful here, as will an anti-inflammatory diet. Likewise, get care early. A new problem is always easier to chase away than an entrenched one. Myofascial release will free up adhesions. Osteopathic medical massage can retrain your tight muscles, and acupuncture will reduce inflammation. Rest. Stretch gently, and do any physical therapy exercises your healthcare professional recommends. Try to avoid that activity for a while. 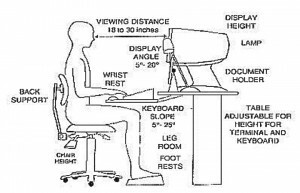 Frequently re-examine your routine and ergonomics to identify any areas that need improvement. By nipping problems in the bud, you can prevent a long-term aggravation. This entry was posted in Healthy lifestyle, Muscle & Joint, Pain Management and tagged acupuncture, carpal tunnel, ergonomic, job, job stress, joint pain, lifestyle changes, shoulder, sports medicine by Sharon Rose. Bookmark the permalink.